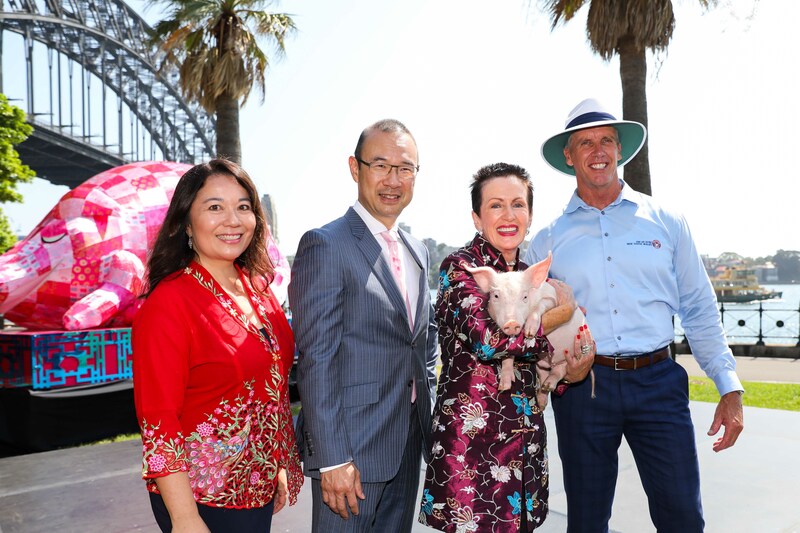 Lord Mayor Clover Moore today launched Sydney’s biggest ever celebrations to mark the Lunar New Year with a line-up of exciting events for everyone. Sydney Lunar Festival the largest celebration of Lunar Festival outside of Asia, is expected to attract upwards of 1.3 million visitors from 1 to 10 February to celebrate the Year of the Pig. 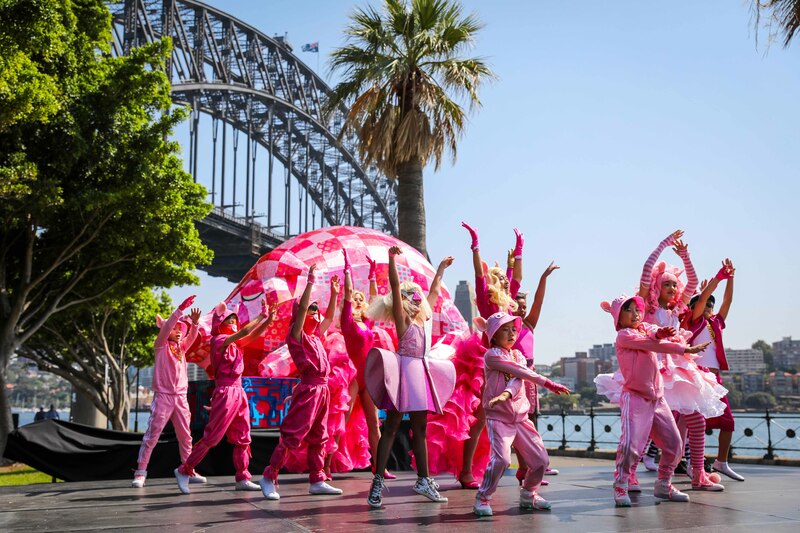 The City of Sydney festival will include the popular Lunar Lanterns exhibition, performances by a cross-section of Sydney’s Asian communities, Chinatown celebrations, dragon boat races, food offerings, lion dancing and even a Guinness World Record attempt. 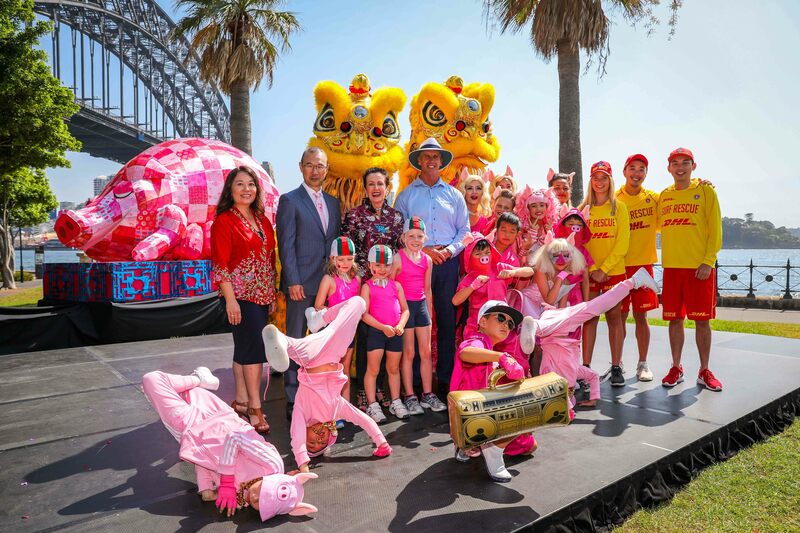 “Our Sydney Lunar Festival will feature a wide range of family-friendly events, with something for everyone, from lanterns and lion dancing to international performances and dragon boat racing”, said Lord Mayor Clover Moore. A contemporary interpretation of the 12 animal signs in the Chinese zodiac, the Lunar Lanterns exhibition will line the foreshore from the Sydney Opera House, around Circular Quay to the Overseas Passenger Terminal. Blending modern technology with classic Chinese techniques, the magical lanterns will light up Sydney’s harbour for 10 days and nights. Four new lanterns designed by Asian-Australian artists will be unveiled: a 5-metre tall 3-D pig lantern by Justin Qian; an elaborate 8-metre stack of monkeys by Louise Zhang; three 2.8-metre bright paper cut-style sheep by Pamela See and a 6-metre inflatable ox by Laurens Tan. A 2.5m by 2.2m golden chandelier of flying pigs will be suspended high above the centre of Pitt Street Mall. The Light of Good Fortune, designed by McDermott Baxter in collaboration with artists Matt Hou Him Lai and Jincheng Jiang, is a quirky nod to the expression ‘pigs might fly’ and symbolises generosity and material prosperity. Always a roaring success with crowds, lion dance performances will take place throughout the festival. There will be performances every Friday, Saturday and Sunday night in Chinatown by various lion dance troupes including the internationally-renowned Chinese Youth League. Set among the glow of the Lunar Lanterns, illuminated lions will perform at Circular Quay on Friday 8 and Saturday 9 February. Meticulously decorated with hundreds of LEDs, the lions and a 12m-long dragon will come to life with slick and graceful movements that mimic the emotions of the mystical animals. Hundreds of red, gold and pink Chinese lanterns suspended over Dixon Street will create a spectacular overhead ‘curtain’ in the heart of Chinatown. Visitors to Chinatown can also delight in the sights and sounds of Lunar New Year celebrations with traditional lion dancers bringing drumming, splendour and humour on Friday, Saturday and Sunday evenings. With all the colour and excitement of an Asian marketplace, Chinatown and Haymarket offer an enticing mix of restaurants, noodle bars, food halls, and shops and markets full of bargains. Visitors can step into the AYAM Zodiac Roulette Tuk Tuk at Dixon Street Mall to discover their ‘destiny dish’ and receive a personalised horoscope prediction for 2019. Participants will also receive an AYAM ingredient and recipe to make their destiny dish at home. The Chinese Garden of Friendship will celebrate the Year of the Pig with performances, demonstrations, lion dances and workshops on Chinese heritage and culture. Performers from a wide range of community groups will take to the stage at First Fleet Park, The Rocks. This free celebration of culture, community and friendship will feature traditional and contemporary performances by Chinese, Korean, Thai, Japanese, Vietnamese, Malaysian and Indonesian community groups. WSFM’s Jonesy & Amanda are teaming with the City of Sydney and My Kitchen Rules to attempt a Guinness World Records title for the most people eating dumplings in the one location at the one time. The Largest Yum Cha Meal will take place at 11am on Tuesday 5 February at Tumbalong Park, Darling Harbour. Registrations to take part in the event are open via WSFM’s Jonesy & Amanda website. 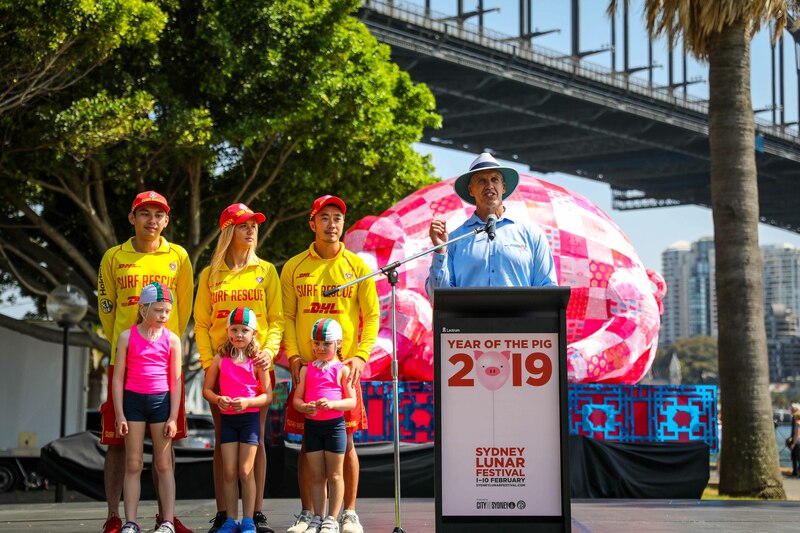 As the official charity partner for Sydney Lunar Festival, Surf Lifesaving NSW will add its signature red and yellow to the event with a pop-up beach in the city. First Fleet Park in The Rocks will be decked out in beach chairs, umbrellas and a blow-up ball pit. Visitors can take part in interactive educational water safety sessions, CPR competitions, children’s entertainment and make-your-own zinc workshops. Volunteer surf lifesavers will be on hand to demonstrate everything there is to know about being safe in the water. Ancient Chinese civilisations will come to life in a whirl of colour and pageantry when a visiting delegation of performers showcases traditional Chinese culture and arts. A troupe of 30 performers from Guizhou Province will entertain crowds with visual and musical delights on Saturday 9 February in First Fleet Park, The Rocks. Indigenous music including the famed Kam Big Song, will also be performed and is regarded as the melody from heaven. In celebration of the Lunar New Year and the Year of the Pig, the Sydney Harbour Bridge will be lit in festive red and pink every night during the festival from 8.15pm until 1am. The biggest dragon boat races in the southern hemisphere return to Darling Harbour for the final weekend of the festival. The weekend of races begins with a traditional Taoist monk ceremony to ensure a safe weekend of racing by blessing the waters and dotting the eyes of each boat’s figureheads to awaken the dragons. More than 100,000 spectators will line the foreshore to watch 3,000 corporate, charity and sports club participants battle it out for top honours in the two-day regatta. The Sydney Opera House will ring in the Year of the Pig with a vibrant program of Lunar New Year festivities including tai chi at sunrise, the hero pig Lunar Lantern, luminous red sails, exquisite orchestral music and delectable dining. Visitors can dine on a festive special from one of the Opera House’s restaurants and bars, or uncover the stories, history and magic of the Opera House with a Mandarin guided tour. More than 80 associated events across Sydney will feature as part of the Lunar New Year celebrations. These include The Rocks Lunar Markets, Sydney Symphony Orchestra’s Chinese New Year concert, tours, talks and karaoke.